SCVHistory.com TL8001 | Heritage Junction | SPRR Saugus Depot Moves to Hart Park, 1980; Donor List. June 25, 1980 — Rescued by the Santa Clarita Valley Historical Society with huge community participation, the Southern Pacific Railroad's 1887 Saugus depot comes to rest in its new location at William S. Hart Regional County Park after moving overnight from its original location two miles to the north. Photos by Ted Lamkin. 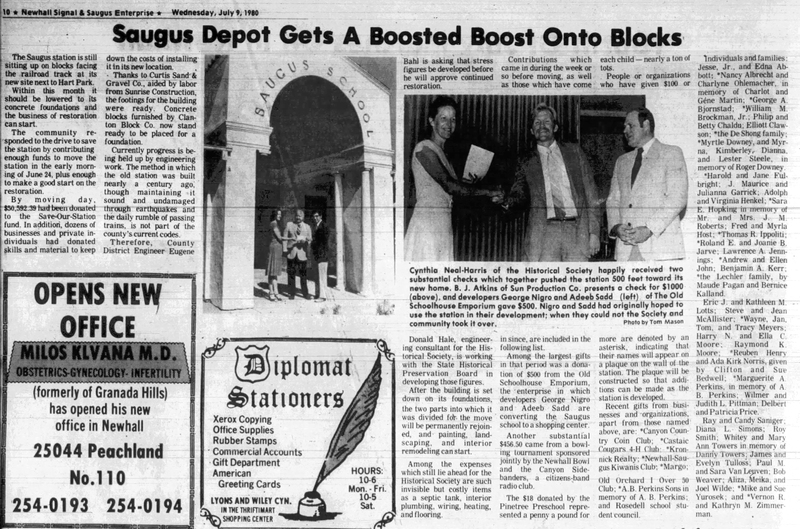 Saugus Depot Gets A Boosted Boost Onto Blocks. The Newhall Signal and Saugus Enterprise | Wednesday, July 9, 1980. The Saugus station is still sitting up on blocks facing the railroad track at its new site next to Hart Park. Within this month it should be lowered to its concrete foundations and the business of restoration can start. The community responded to the drive to save the station by contributing enough funds to move the station in the early morning of June 24, plus enough to make a good start on the restoration. By moving day, $50,592.39 had been donated to the Save-Our-Station fund. In addition, dozens of businesses and private individuals had donated skills and material to keep down the costs of installing it in its new location. Thanks to Curtis Sand & Gravel Co., aided by labor from Sunrise Construction, the footings for the building were ready. Concrete blocks furnished by Clanton Block Co. now stand ready to be placed for a foundation. Currently progress is being held up by engineering work. The method in which the old station was built nearly a century ago, though maintaining it sound and undamaged through earthquakes and the daily rumble of passing trains, is not part of the county's current codes. Therefore, County District Engineer Eugene Bahl is asking that stress figures be developed before he will approve continued restoration. Donald Hale, engineering consultant for the Historical Society, is working with the State Historical Preservation Board in developing those figures. After the building is set down on its foundations, the two parts into which it was divided for the move will be permanently rejoined, and painting, landscaping, and interior remodeling can start. Among the expenses which still lie ahead for the Historical Society are such invisible but costly items as a septic tank, interior plumbing, wiring, heating and flooring. Contributions which came in during the week or so before moving, as well as those which have come in since, are included in the following list. Among the largest gilts in that period was a donation of $500 from the Old Schoolhouse Emporium, the enterprise in which developers George Nigro and Adeeb Sadd are converting the Saugus School to a shopping center. Another substantial $456.50 came from a bowling tournament sponsored jointly by the Newhall Bowl and the Canyon Sidebanders, a citizens-band radio club. The $18 donated by the Pinetree Preschool represented a penny a pound for each child — nearly a ton of tots. People or organizations who have given $100 or more are denoted by an asterisk, indicating that their names will appear on a plaque on the wall of the station. The plaque will be constructed so that additions can be made as the station is developed. Recent gifts from businesses and organizations, apart from those named above, are: *Canyon Country Coin Club; *Castaic Cougars 4-H Club; *Kronnick Realty; *Newhall-Saugus Kiwanis Club; *Margo; Old Orchard I Over 50 Club; *A.B. Perkins Sons in memory of A.B. Perkins; and Rosedell school student council. Individuals and families: Jesse Jr. and Edna Abbott; *Nancy Albrecht and Charlyne Ohlemacher, in memory of Charlot and Géne Martin; *George A. Bjornstad; *William M. Brockman Jr.; Philip and Betty Chaldu; Elliott Clawson; *the DeShong family; *Myrtle Downey, and Myrna, Kimberley, Dianna, and Lester Steele, in memory of Roger Downey. *Harold and Jane Fulbright; J. Maurice and Johanna Garrick; Adolph and Virginia Henkel; *Sara E. Hopking in memory of Mr. and Mrs J.M. Roberts; Fred and Myrla Host; *Thomas R. Ippoliti; *Roland E. and Joanie B. Jarve; Lawrence A. Jennings; *Andrew and Ellen John; Benjamin A. Kerr; *the Lechler family, by Maude Pagan and Bernice Kalland. Eric J. and Kathleen M. LOtts; Steve and Jean McAllister; *Wayne, Jan, Tom, and Tracy Meyers; Harry N. and Ella C. Moore; Raymond K. Moore; *Reuben Henry and Ada Kirk Norris. given by Clifton and Sue Bedwell; *Marguerite A. Perkins, in memory of A.B. Perkins; Wilmer and Judith L. Pittman; Delbert and Patricia Price. Ray and Candy Saniger; Diana L. Simons; Roy Smith; Whitey and Mary Ann Towers in memory of Danny Towers; James and Evelyn Tulloss; Paul M. and Sara Van Leuven; Bob Weaver; Aliza, Meika, and Joel Wilde; *Mike and Sue Yurosek; and *Vernon R. and Kathryn M. Zimmerman. TL8001: Download original images here.